The WiComm tools are an add-on to µWave Wizard™ developed by the WiComm Center of Excellence for Wireless Communication Engineering in Gdansk, Poland. The WiComm Center's research focus is on computational electromagnetics and photonics as well as on CAD of passive microwave structures - especially filters. 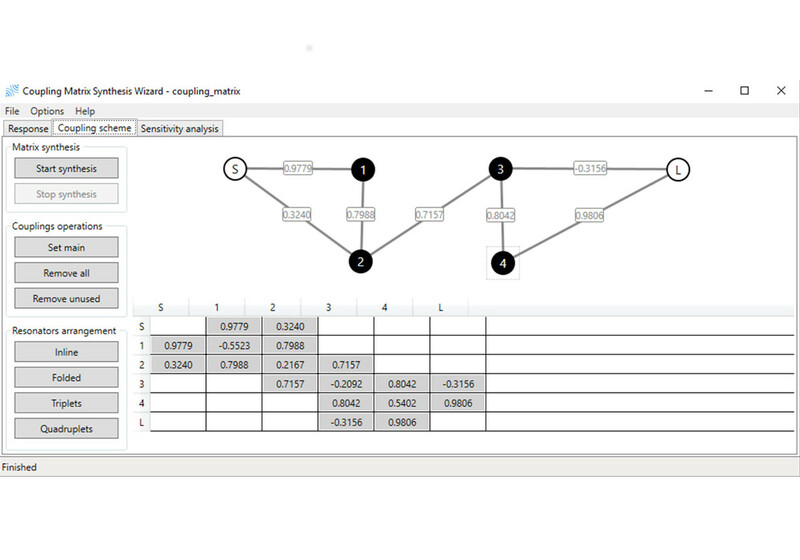 The WiComm Tools package consists of a Combline Synthesis Tool and a Coupling Matrix Synthesis Tool. Both products are also available separately. The Combline Filters Synthesis Wizard (CFSW) allows a fast synthesis and optimization of narrow- and broadband combline pass band filters by using the mode-matching/2D-FEM/3D-FEM technique for the multimodal computation. The simulation is provided by Mician's µWave Wizard™. The CFSW uses a novel technique for the synthesis of the coupling coefficients and a new efficient optimization method. The filters can be of type inline or folded. In case of a narrow band filter the cavities are separated by irises where each iris can include finite radii for milling purposes. In case of a broadband filter the design consists of posts only. The feeding probe is typically an electric probe for narrowband and a magnetic probe for broadband applications. The usage of the tools is intuitive and straight forward. In the first step the user adds the specification of the filter. In the next step the user defines the waveguide housing and probes. These parameters are more or less already sufficient to start the synthesis. During the synthesis a plot window shows continuously the improvements and the value of the error. After a successful synthesis and optimization the initial filter parameters are assigned directly to a µWave Wizard™ project. All elements, empty waveguides, variables and optimization goals are set automatically. 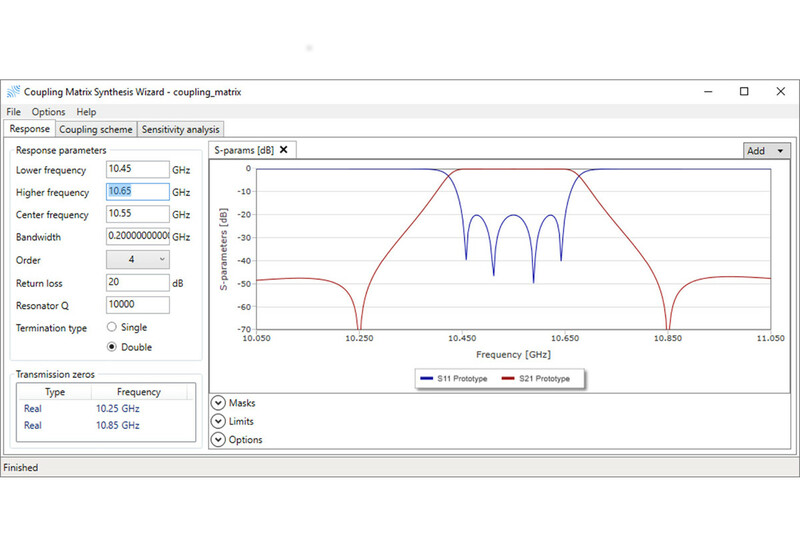 An analysis in µWave Wizard™ will show the previous shown optimized curve again. If required a short post optimization can be done by using the built-in optimizers of µWave Wizard™ and a verification by full 3D-FEM with µWave Wizard's™ 3D-FEM solver is possible to crosscheck the results. WiComm's bandpass synthesis wizard allows a fast synthesis of the coupling matrix for a bandpass filter with a generalized Chebyshev response and required specification (filter order, return loss level, defined pure-imaginary transmission or complex transmission zeros and filter topology). The resulting coupling matrix is an excellent starting point for a filter design. The bandpass synthesis wizard uses a unique technique for coupling matrix synthesis, which is capable to find the couplings for various non-standard, unique topologies including several load (source)-resonator and direct load-source couplings. Support of arbitrary, user defined topologies. Support of direct source-load coupling and several source(load)-resonator couplings. Support of pure-imaginary and pairs of complex (equalization) zeros. Robust algorithm of coupling matrix synthesis. User-defined signs of the couplings. Low-pass and band-pass input of filter specification. On-the-fly preview of the filter prototype polynomials. Built-in optimization module of equalization (complex) zeros placement to flatten group delay. Automated transform between low-pass and band-pass prototypes. User-defined masks on filter response. Easy tuning of the imaginary zeros with slider. Preview of the response with finite Q-factor resonators. Export of the coupling matrix to text file.